Small and frail, Tutankhamen was an all but ignored member of the royal family of the great Egyptian pharoah Amenhotep III. At the school of the "menoi," or tutors, he did not excel at physical activities with the other royal princes. Keeping to himself, he observed and admired the work of his father's craftsmen, who built glorious temples to Egypt's many gods. Someday he too would find a gift for those gods. Then Amenhotep III died and the unpopular reign of Tutankhamen's brother ended in mystery. Who now would be pharoah? Could it be a boy of only ten? 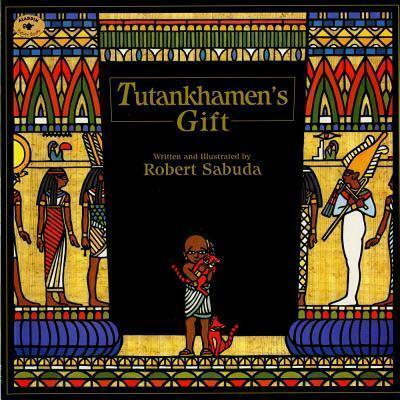 As he did with the life of "Saint Valentine" (Atheneum, 1992), Robert Sabuda combines simple text with artwork true to the historical period in which Tutankhamen lived. Robert Sabuda is one of the most innovative and inventive children's book creators and is known worldwide for his amazing pop-up paper engineering. His books include Alice's Adventures in Wonderland, The Wonderful Wizard of Oz, The Twelve Days of Christmas, The Night Before Christmas, The Winter's Tale, Peter Pan, Beauty and the Beast, to name but afew, have garnered numerous awards and have made the New York Times bestseller lists on many occasions. He lives in New York City. Robert Sabuda is one of the most innovative and inventive children's book creators and is known worldwide for his amazing pop-up paper engineering. His books include Alice's Adventures in Wonderland, The Wonderful Wizard of Oz, The Twelve Days of Christmas, The Night Before Christmas, The Winter's Tale, Peter Pan, Beauty and the Beast, to name but afew, have garnered numerous awards and have made the New York Times bestseller lists on many occasions. He lives in New York City.